The show features a cast of ordinary British people attempting to survive on a remote, uninhabited Pacific Island. Left completely alone, the show is recorded entirely by the castaways themselves. A handful of the islanders are trained camera operators, but a large volume of content is captured via GoPro cameras attached to the contestants. At the end of the six weeks of filming, all the footage is then edited to create the show we see on Channel 4. An ambitious, self-shot show like The Island is always seeking out new technology and, over several series of the show, they've adopted many innovative solutions that have made capturing content as easy as possible for the islanders, as well as making the edit process easier and more efficient. But one challenge they found to be a persistent stumbling block was synchronising the huge volumes of non-timecoded GoPro footage generated. With the islanders often participating in dangerous activities that frequently involve being in or around water, GoPros are a great way to capture this kind of content. If a group decides to go on a twenty-minute hike to find water, they will naturally choose to take a few GoPros over a bulky television camera. The fact that they are so easy to use is also a bonus, given that most of the 'camera operators' are those living through a harsh survival experience on the island. However, out-of-the-box GoPro cameras do not have the facility to generate timecode. Whereas footage from mainstream television cameras can be dropped into edit timelines and automatically aligned, synchronising GoPro footage has historically been a time-consuming, manual process. In the past, participants used the sound of a clap as an audio cue to mark the start of filming as a workaround for GoPros, or they read out the timecode, but with the islanders already being pushed to their limits, this was an extra task that could easily be forgotten. As a result, large portions of production time on The Island were spent scouring through the footage, logging shots for key storylines, finding the exciting content and then manually synchronising it across all the cameras. To put this in context, the islanders get through approximately five GoPro memory cards per day - that's a lot of non-timecoded footage to be searched, logged, and manually synchronised. What the postproduction team really needed was a more automatic solution that required no memory or effort from the islanders and that integrated seamlessly into the edit packages back in postproduction. 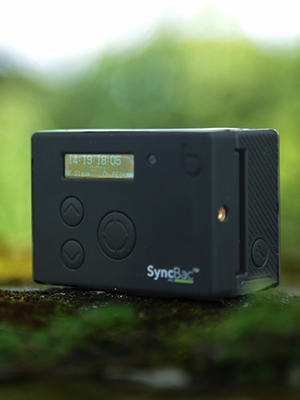 When we released SyncBac PRO, which provided a way to embed timecode into GoPro footage, they were keen to use it on The Island as soon as possible. Some of the first SyncBac PROs we shipped went straight to Panama to be used on the show. With SyncBac PRO units clipped to all the GoPro cameras, each camera was able to generate timecode and the cameras could synchronise with each other over RF. At the end of filming, the memory cards from each camera contained data files stamped with the same embedded timecode. This allowed all media to be easily dropped into the edit timeline and automatically aligned. It previously took a phenomenally long time to sync GoPro media but, with the addition of timecode, this was reduced to seconds per clip. The result was a very happy postproduction team. In fact, I think the jubilant cheers from the UK-based edit suite could quite possibly have been heard by their colleagues in the South Pacific!